Step 1: Release playlist. Step 2: Top the Spotify charts. Spotify’s gambit to capitalize on 2016 election obsessiveness has been both brilliantly simple and effective, revolving as it does around the act of playlist creation. The list of politicians who have created playlists on Spotify’s platform this year has included Hillary Clinton, Sen. Cory Booker, House Speaker Paul Ryan, Sen. Orrin Hatch and Sen. Amy Klobuchar. 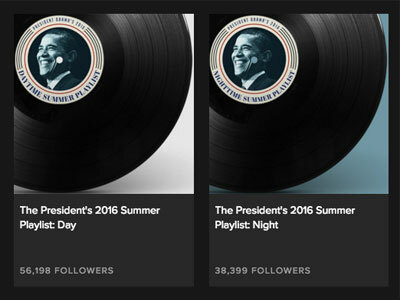 Just this month the White House dropped its own Spotify playlists by both POTUS and the Bidens, although, it should be noted, these are not the first playlists for either the Bidens or the Obamas on the platform. And while it can be assumed that most people, politicos or not, would love the opportunity to share their musical tastes, however deliberately cultivated or not, with the larger world, there is the other side of the equation: are others interested in listening? In President Obama’s case, it has been a very definitive yes. His summer playlist, which by White House accounts was legitimately handpicked by POTUS himself, was number one on Spotify’s global playlist, outside of those Spotify itself creates. And reaching that spot, reports New York Times’ Gardiner Harris, takes more than earning a few seconds of curious clicking. “That level of popularity occurs only when listeners do more than sample the songs, but actually enjoy the set, said Jonathan Prince, a Spotify spokesman,” writes Harris.